I hope the new year brings you joy, peace and happiness. This holiday season while you think about the new resolution list and the weight loss and office politics and job hunting and the much awaited salary raise and the calorie intake at family dinners- stop. Take a moment and think about what you really want. What are you hoping in life? What makes you happy, what makes you go that extra mile? When was the last time you thought about yourself and not your office self? We are so busy trying to manage projects and team and globally located teams and their endless problems that we forget why we chose our profession- what made us happy, what made the eyes sparkle, what brought the smile and contentment in life. do you stil have a hobby? when was the last time you took a real vacation? what do you do to improve yourself emotionally every year? do you enjoy going to your job everyday? or are you tired and exhausted every morning at the idea of going back to work again? do you feel content with your life? do you make time for your personal life and specially for you? 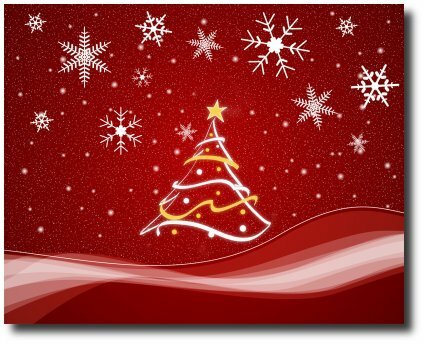 This Christmas while you open gifts, look back at the years and what has happened, dont regret mistakes instead learn from them and look into the future positively. Take time for you and make time for others to inspire them, help them and grow with them! While you enjoy this, I am shuttling between cities in India, enjoying good food and missing my time away from the blog. With so much happening, I'll be post some pics here for sure! This year, I’m thankful to so many of you, specially my readers for the site and the blog! This post is dedicated to my friends -the dynamic designer, the chic developer and few others who helped me with my site, listened for hours about the ideas, brainstormed together and made it happen. They are the best! 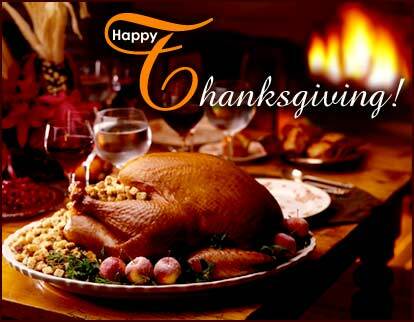 So, thank you dear friends….happy thanksgiving! The last few days has taught me a lot. I have visited more stores in the last few days than I have in the last 5 years. In doing so, I have talked to lots of people, researched things on the internet I wanted to buy and here’s the lesson- nothing beats human connection. No matter what you do and who you are- the most powerful tool is human connection. It makes you turn back and take decisions you otherwise wouldn’t have perhaps. If it’s your client, your team members or the newbie joining your team, make sure your gift of connection is never lost in the business. This holiday season, thank someone, smile and help another being. It is being human and its priceless. This last week I was caught up in cold, flu and some major decisions that I am taking to make sure my list of 5 things to do before I am 35 actually happens. So, while I a running around the city and getting things done, I thought you might enjoy this enchanting video that I have seen more than 10 for sure. The original link is here. Enjoy the wonders of technology, while I jump back in the car and drive around to get more errands done. It's also time of the year to consider what questions to put up for my new year special- if you have suggestions I would love to hear. This week I committed myself to know new ideas, to learn more about how others are doing things and be happy. This week I decided to slow down and see where I am going, to try minimalism and be more aware of myself. To gather my thoughts and plan my action on what makes me composed and happy and less stressed out. To share, read and smile more often. This is what I read in NY Times which lead to finding out more about Asana- a project management software in making. 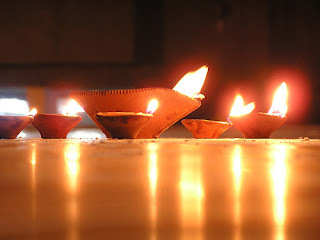 This weekend is Diwali which means I am all about lights, happiness and yummy food! 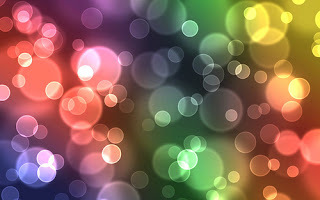 Wishing all of you the brightness, sparkles and happiness every single day. Happy Diwali! It does, most of the times. Last year while travelling from India to London for the first time, after landing in Heathrow I was trying to find my way to get my luggage. The guy sitting next to me in the flight was zigzagging through the airport, so I assumed he was familiar with the airport, so I just followed him, knowing that he will have to pick up the luggage as well. Turned out, I followed him to the men’s restroom. I stopped, turned around and laughed at myself. What was I thinking? This is what happens when you follow someone without thinking. Make sure you know what you are doing and why? If you are looking for mentors who can help you take the next step, try SIPM, there are no charges for membership and you get to meet PM's from all over the world who will take the time to help you for your next move. I have always believed that Project Managers given their interest in running a business can do it really well. Today’s interview is with Valerie Thorn BSc, FRSA- CEO and founder of AND Technology Research Ltd (UK) who personally has a 30 year practical experience in software and embedded engineering runs a company successfully. That’s not all, she started her business when she was only 25! Keep reading for inspiration, lessons learnt and what you should know if you are planning your own business. Hi Valerie, please tell us something about your organization and how you started it. We are AND Technology Research Ltd, a small private company – currently 10 staff situated in a small village between London and Cambridge in the UK. I started the company in 1980 when I was 25. I saw great potential in the use of distributed computing power within businesses, for communications and control. I began with some funding of my own and practical support of my parents and sister. Since you have been managing a company and also running projects, which do you think is more challenging and why? Running the company is in some ways just the same as running a project so both are challenging; however there are some differences Projects have an intensity and significant time pressures. For instance if you don’t start a project on time, then you shouldn’t be surprised if you don’t finish on time; running a company in which you have a long term interest does not normally suffer from this sort of intensity. However overall I would say that the number of variables and the effects that your decisions have on people’s lives makes running a company more challenging. How important are mistakes in trying to run a company? If you don’t make mistakes then you don’t learn, what’s most important is how you deal them. The main thing to remember is that mistakes have to be managed or corrected for the best interest of the company, not for the best interest of the manager/owner. Personal conflict can inevitably occur but handling the conflict should add to the learning. So mistakes are important, you have to learn to recognise when mistakes occur, accept them, deal with them and not get hung up on them. Do you think a good project manager can also be successful business person? Yes I do, in fact they can make excellent business people, but they have to be able to cope with uncertainty. Project managers have to engage with a variety of project stakeholders and manipulate resources and time to make to project work. A good business person needs to be able to do this; however business people also need generally to cope with uncertain situations where either the resources or the time are just not as they would like them to be. They have to be a little more creative and inventive and be prepared to take the responsibility for risk. Three important qualities that both project managers and entrepreneurs should have? Vision and focus for what is to be achieved. Ability to inspire others and to carry the message of the vision forward. One thing you wish you knew when you started out. The importance of the supply chain to a business. By this I mean, not just where your market is but how to navigate supply chains within the market in order to maximise business potential. So, when organizations like you hire newbies- what are you looking for? People who, given a necessary skill level, then demonstrate the potential to learn and to adapt to change, plus an ability to laugh. Valerie is also an active participant in a number of creative and electronic industry organisations. Her career has involved creating digital and electronics based solutions for consumer, industrial and telecommunications products. AND has received numerous awards for innovation over its 30 year life-span and Valerie’s achievements in small business management have also been recognised. 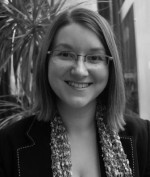 Valerie’s expertise lies in embedded software and the role played by software as Intellectual Property. She is engaged in research into technology management and innovation. To know more about AND visit their website here. I have built my own door for someone to come knocking (Hint: If opportunity doesn’t knock, build a door -Milton Berle). And I need your help. I know you are busy- with meetings, stakeholder communications, more charts and graphs, keeping up with your coffee addiction and running PMO’s. I’ll cut it short and say- I am looking for my next job/project/assignment. I'm diligent, smart and have positive review of my projects and client handling, it led to clients coming back for other projects as well. So, I know what I am doing and where I want to go after I finish building the door. I like challenges, learning new skills, techniques and just when you think it is impossible- I will change your mind. I take risks and listen to my inner voice. I deal with clients and team members as other human beings and love what I do so much that I don’t want to give it up. 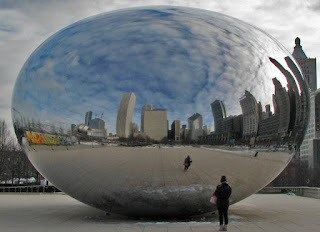 I’m looking for an organization/PMO preferably in and around Chicago but don’t mind relocating within States or outside as long as I get to do what I love- more projects. If you don’t have an empty chair in sight, feel free to forward this to someone else who might. 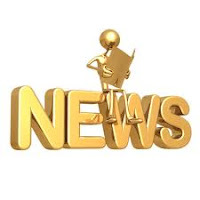 If you would like to know more click here or I can connect with you on Linkedin. If you really want to know how I work, feel free to contact my co-workers or fellow bloggers independently who have known me for years now, that way you don’t have to worry about me taking them out to expensive lunches to make sure they give good reviews. They know me well enough to talk about my work, ideas, implementation skills, teamwork, independent thinking capability, decision making and completion of sucessful projects. If you need an updated resume email me (steppingintopm@gmail.com)please. Your blog is in Alltop and that says a lot about the quality of your posts- tell us something about your blog. Thanks Soma. Alltop included my site a long time ago under the leadership category, back when 13apples.com was lap31.com. I am not certain if my site is still listed as one of the upcoming and promising leadership blogs. That was a proud moment for me and I still cherish every win I have ever had. The origin of the 13apples Blog started with a simple question I asked myself when I turned 30yrs old - am I ready to lead? You can say I was a bit paranoid. I looked back into what I had achieved in life and tried to figure out where I was headed. My writing was a way for me to find my path forward. I considered the site to be a pit stop for me. I was in a race called life and like any race driver I was in the pit stop to refuel, change tires, tune up, and zoom out to race another lap. As you can tell, I am a big F1 (Formula 1) racing fan, which is also where the original name for the site "lap31.com" came from as I was on my 31st lap in a race called life. Why did you choose to write about leadership? I believe that there is a leader in every one of us. As I was reflecting on my leadership lessons through my writing and life experiences, I thought of giving back to the world by exploring the mindset of leaders in every walk of life and thus provide every one who visits my site with the opportunity to awaken the leader in them, to share their leadership stories, to collaborate. Eventually it led to the site slogan "where leaders collaborate". What are the qualities of a real leader, do you have a favorite? Leadership is about people. We lead by creating an environment of trust, transparency, openness, empowerment and support; where failure is an opportunity to learn, where success stories are celebrated. Leaders are social beings. They create collaborative teams beyond boundaries and borders, bridging cultural divides, in a globally diverse workspace. Leaders inspire themselves by learning and listening so they can in turn inspire others by sharing and collaborating. How did you end up being in project management? Is this something you always wanted to do? Project Management was never a goal for me, at least not when I started out in the IT field 11 years ago. I was an ASP developer, moved on to PHP and to Java development before I was promoted to a Lead role to manage the company's first dot net project overseas. I continued to wear multiple hats, that of a developer and a lead for another 2 years till I realized that I needed to be a full time lead if I am going to be held accountable for the project. During 2004-05 I was doing Project Leadership full time which gradually helped me go up the ranks to a Project Manager and now Program Manager. In short, I worked my way to project/program management. I know you are part of toastmasters, so do you also read a lot? What are the last 3 books you read? Yes, I have been part of toastmasters since 2008. I spoke about my foray into toastmasters and the journey in a speech last year, which you can find at this link here . I do read a lot, especially these days. I am glad you asked me about book coz I read 3 very insightful books recently. The interesting part is that each author led me to the next book. Any new plans for your blog? I have so many plans but I am taking it one step at a time. With my salaried job, toastmasters, family life and networking, I struggle to find time to put my 13apples plans into supersonic speed. But someday I will when my life permits. Some immediate plans are to increase my subscription base. I have around 30 amazing subscribers now but I want to grow that as rapidly as possible. I will also continue to have 1 post per week emailed to my subscribers. I am also working on an eBook that I will be distributing freely to my subscribers, around a new concept I am working on called the Circle of Influence. These are the plans in action right now. By the way, congratulations on your PMP- how much do you think preparation time one needs to go for it? Thank You! Frankly, I spent a year of ad-hoc studying which was mainly listening to the PMPrepcast (which you are promoting on your website as well). Ad-hoc studying will not really get you through the test. What made a difference for me was the 1 week I took off from work and put my brain and body into overdrive to piece it all together. However, that is not the method I would recommend. Instead, I would advice any PMP aspirant to put in 3 months of effort (2 hours per weekday) and a dedicated review time 2 weeks prior to the exam, mainly to attempt sample tests. Three qualities you think every aspiring project manager should have? Thank you for your time Raj. So which side are you on- 80 or 20? This is a guest blog post from my friend and a budding Project Manager Sanchita Bhattacharjee and along with our love of Project Management; we also happen to share our last name. She talks about the Pareto Principle, brushes on her discovery of project management and how she plans to implement it in her life. The other day, someone asked me about the Pareto principle and I fell from the sky! Faintly did I hear economist Vilfredo Pareto and Juran's names in the University corridors but that's all. Never really thought I could use it one day in the work I was learning myself- yes, Project Management. What Pareto initially observed was that 80% of the land or wealth in Italy was owned by 20% of the population. Not too sure if Gregor Mendel also inferred that 20% of the pea pods contribute to 80% of peas produced when he was playing with genetics in his garden:) Come to Software, even Microsoft noted that by fixing only 20% of bugs they were able to eliminate 80% of errors reported. Interestingly when Business Schools started seeing more of it, it was concluded that actually 80% of your total sales come from 20% of your clients. So the next question comes up, how can we imply this in Project Management? A general response would be that in any project, the first 10% and last 10% of a project are the most crucial parts. In other words the Initiation and Delivery Phases will take up 80% of your time and resource. Even the very famous management consultant Richard Koch discusses how to apply the Pareto principle in all walks of life. So here is the deal, so far all of us have heard and believed in the 'work smart' technique. Perhaps, the same is based on focusing your energy, your attention of 20% of things which really matter. 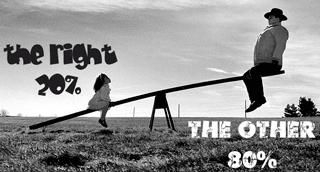 Stop being on the 80 side and keep struggling with causes which can be treated later. So first step would be to identify them. Even if you are missing out points and areas in your daily life, make sure they do NOT fall under the significant 20%. So work smart but on the right things. To know more read on and do not forget to mention how YOU imply the 80-20 rule in your work and in your life! The site will be unavailable this weekend, while I and my designer friend try to upload the new design to bring in a better visual experience for you. She got me started on project management and is one of my favorite person who inspires me everyday. She is a great person to talk to, email for some advise and meeting her last year in person was the best thing ever- meet Elizabeth Harrin. Her second book is out and she is providing a free course, if you want to ramp up on your social media skills today. Elizabeth, congratulations on your new book! Tell us something about your book and why did you choose to write something so specifically about project management and social media? I’m part of PMI’s New Media Council and at the Congress in Orlando last year we did a presentation on the uses of social media for project teams. It was amazingly well attended and people were standing up at the back as the room was so busy. There were other presentations at Congress on new technologies that also had their rooms packed out. It made me realize that there was an appetite amongst the project management community to learn about how we can embrace new technology and specifically social media to help with the way we manage project teams. There are lots of books written about how to use social media for marketing and communication with customers, but nothing about how to use it behind the firewall for collaboration and communication between colleagues. That’s the gap I was trying to fill. I know you are an advanced user of social media, however how much of it do you use in ongoing projects and how? I am personally inspired by simply observing how much you are doing everyday- the book, the Otobos Group (your company), the job - how do you manage to keep everything together? Do you plan on a regular basis or yearly? 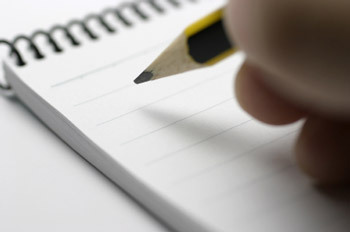 Do you make a list of things you want to do and achieve every New Year and follow the plan or is it more instinctive? I have two jobs and a life! I’m Head of IT Programme Delivery for a UK healthcare company, and I run my own company, a business writing practice that supplies content to websites. We do other writing-related things too; recently I wrote a project management case study for a professor to use in her university classes, for example. Do I plan? Well, as a project manager I should say yes, but it is a pretty flexible plan. I’ve been blogging for nearly 5 years and this is the first year I have drawn up an editorial calendar. I have a spreadsheet with a tab per month and in each month I note what I want to publish when, notes for the following month and so on. So I can tell you that I have already started thinking about what A Girl’s Guide to Project Management will be doing for its 5th birthday in January! I do regularly review what I would like to achieve, but new opportunities come along all the time and the plan gets reworked. For example, Social Media for Project Managers is officially launched on 11 October, and I wanted to do something alongside that, so I wrote a course which you can get as a series of emails or as a short e-book. That needed to be done in time for the launch of Social Media for Project Managers, but I have more flexibility with other deadlines. In terms of fitting it all in, I believe that people make time for things that they love. I love my healthcare job and I love writing. It’s all about prioritizing your time. I still have enough hours in the day to fit in the rest of my life, family, hobbies. We waste a lot of time not doing the right things. Tell us about a day in the life of Elizabeth Harrin. OK, I’ll pick today. I got up, checked my emails, and responded to a client who is enquiring about some website content for his site. I left for the office, and read a bit more of The Get-it-Done Guy’s 9 Steps to Work Less and Do More, which is the book I’m currently reviewing. I picked up a coffee on the way, and got to my desk about 8.45am. The office day comprises of project planning, financial management and budgets, a team meeting, prep for a meeting next week, following up on outstanding tasks, catching up on emails, reviewing documentation and speaking to suppliers. I left the office after 5pm and head home, reading a daily paper on the journey. Once I’m at home, I reviewed personal and Otobos Group emails that I received through the day. Many of the Otobos Group’s clients are in the U.S. so they are still at work by the time I get to their messages. I do a bit of writing or office admin, catching up with sources for articles, talking to editors or editing video content. Dinner, more work, an episode of CSI and bed! Like many people who run their own business, I work long hours, but I love what I do so I don’t notice it until someone like you asks. Did you always envision being who you are today as a child? What did you want to be then and what do you think changed you goal? I never grew up thinking I would be a project manager. Who knew what one of those was? I wanted to be an ambulance driver. My goal was changed when I realized I could join the ambulance service straight out of school and I really wanted to go to university first. At university it changed again. What a difficult question! I like learning, so I’m inspired by new things. And snow. I do like a good snowy landscape. Do you have a new list coming up for New Year? I expect I will re-work an old list and see how well I have done. As I said, next year is A Girl’s Guide to Project Management’s 5th birthday, and the 5th year that Project Management in the Real World has been on the shelves, so I think I’ll be doing something around that. Thank you for your time Elizabeth, always wonderful to have you here. To read her award winning blog click here and to see more on what she is working, visit her shop. How you react during crisis and manage your stress level tells a lot about you. If you are like me where crisis strikes rarely, moments like this can be turned into learning experiences. Handling pressure- Having to deal with the pressure is good perhaps because it keeps you alert and open. It also suddenly teaches you lessons of a lifetime in handling it and keeping your sanity itact also at the same time. 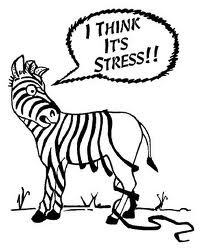 To learn more about stress and learning to handle it, read this. Using the time effectively- When you encounter situations where decisions have to be made quickly, everyone wants to make the right use of time. · You are using time effectively for your own benefit. Support – Your social support is perhaps one of the most important thing at this point. If you are lucky, you already have a strong array of family and friends there for you. No one can make the decision for you, however they can be your sounding board to test ideas, talk about other options and just the fact that they area round you is enough to keep you going. Creating Opportunity- You might not be writing a blog post out of it, but you sure can take the time to make the best decision for you based on the opportunities you have. Chances are you are more open to earning more about yourself and what you can do, this might be the best time to try out things you have been waiting to try. Your acceptance of the situation and willingness to try new things can bring up more than you have been expecting. Before you decide, listen to everyone, look into every single details and most importantly listen to yourself. Don’t let the confusing time drag you down. Make the decision that works best for you- emotionally and professionally. Vulnerability- When in tough situations especially if it is publicly known, feelings of vulnerability are natural. It almost like standing in the glass box where people pass by freely with their opinions about you. The fear of being judged on everything is a nightmare but if you look into more calmly, you will realize you get to know you, your fears which you have been avoiding and things that you haven’t really noticed before. Use this as an opportunity to know from others and you what you should be working on, where you lack and what you can do about it. If it can happen to pros, its ok if it happens to you. Listen you your body- It never lies. You knew this was coming you just wasn't prepared for it. Next time, when your body gives up, don't take it for granted. it has more to say than we realize. Want to read more and reduce your stress, try here . 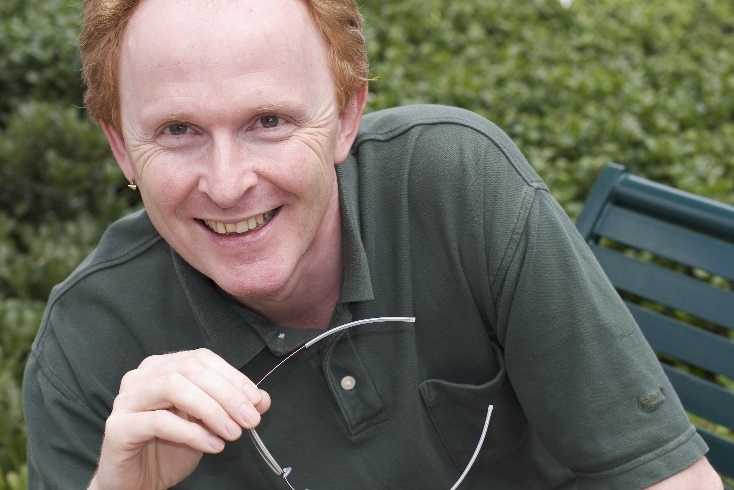 Todays interview is with none other than Cornelius Fichtner, PMP who has been working as a Project Manager in his native Switzerland, in Germany and in the USA for the last 18 years and received his PMP credential in April 2004. Currently, Cornelius helps project managers to stay on top of the industry with his free Project Management Podcast and helps them pass the PMP Exam with The PM PrepCast. His passions obviously are project management methodologies and PMOs. You are known for your podcast. How did this all start and how did you come up with the idea? It's all my wife's fault because in 2004 she gave me an iPod for my birthday. At first, I was just listening to music and some books. Then the first podcasts arrived and I realized that there wasn't one for project managers. At first, I dismissed the idea to create one several times until I finally decided to start The Project Management Podcast at www.pm-podcast.com late in 2005. The mission of this podcast has been "Bringing project management to beginners and experts" ever since. I have to mention that I am a big fan of your prepcast and love it and am going to use it for my PMP preparation- what suggestions do you have for people getting ready for CAPM and PMP? The first step in becoming a CAPM or PMP has to be the mandatory reading of the CAPM Handbook or the PMP Handbook, readily available from PMI. Once you understand the certification process, then it's time to read the PMBOK Guide 3 times, read a PMP Prep Book in parallel and take a prep class as well. In regards to classes I always recommend that people first contact their local PMI chapter because chapters often offer good quality prep classes. For those who don't have the time to go to an in-person class, there is always my own PM PrepCast which allows you to earn your 35 required contact hours on your iPod or other portable player. After about 3 weeks of study, it is also time to start testing your self on sample questions. Begin using the free ones available on the web and then you must subscribe to a paid online service, where you can take simulated PMP exams. Any memorable experience while doing your podcast? In episode #50 I interviewed Max Wideman (www.maxwideman.com), who is one of the most well respected project managers in the USA. I was amazed by his friendliness, graciousness and depth of understanding of project management as a discipline. There is a reason why he has been so successful in his career. And then, in episode 100 I was star struck because I had a chance to interview musician Alan Parsons from the Alan Parsons Project. He has always been a favorite musician of mine (my iPod is full of his music), so having him on the program was fun. Did you always plan to become a project manager? Three qualities every project manager should have? Flexibility, because when you arrive at your office tomorrow morning, I can almost guarantee that much of what you had planned to do may not turn out exactly as you had expected. Empathy, because you are going to have to deal with dozens of people every day and in order to be successful you must be able to think how they do, understand what makes them tick and communicate in a way that makes sense to them. A sense of humor, because you are spending at least 8 hours at work every day and if your work isn't fun or you cannot make it fun, then why are you doing it? Last three books you read. What inspires you everyday to do what you do (working full time and yet make the time for podcasts and new applications for PMP exams)? 2 years ago, I made project management training my full time job. This means, that I have moved over to "The Dark Side" and I am now a project sponsor, who has a lot of PMs reporting to him, so that we can deliver all the great products that we do. But frankly, the thing that keeps me going are people writing me a short email saying that they have passed their exam and how much my training materials have helped them. Cornelius is the 2007 Chair of the Project Management Institute Orange County Chapter. He currently lives in Silverado, California, USA with his wife and their four computers. The winner for PMP exam iphone flashcard application is Dana James. Congratulations Dana! By the way, since I get too many requests for placing ads in my site and in the blog, hopefully the advertise section will provide the answers you are looking for. In case it still doesn't, feel free to email me. Looking for another giveaway- look no further. If you would like a free iPhone free PM application app, all you have to do is sign up at SIPM and then email us or post in Facebook that you want the app. Remember to send your full name in the email, so I know you have also signed up for SIPM. Last day to send email is Sept 20. New York was fantastic; weather was good and am loaded with good memories and great time. •Being around ambitious people works- you see other people implementing their careers and you not only get more information but also learn great things simply by observing them. In NYC you are rubbing shoulders with the best everyday. •They love their careers, not jobs- attachment to their current location is zero, what they are striving for everyday is more opportunities, more money and take every chance to grow. •Networking is part of their lifestyle- they are always looking for new contacts, saving phone numbers and keeping in touch. •They stay updated and gearing up everyday for the next move- reading, taking up classes and stay in top of their games everyday. It’s an initiative NYC professional don’t take for granted. So, whichever city you are in, its time to be inspired! The winner of PM Podcast is Tracey Hitchings. Congratulations Tracey! Details will be sent to your inbox. Whether you are having a long weekend or not, the prep to become a better PM goes on. I didn’t time it out this weekend, because I was busy meeting people. Monday came with bang- car problems, busy day, too many things in hand and resume updates. 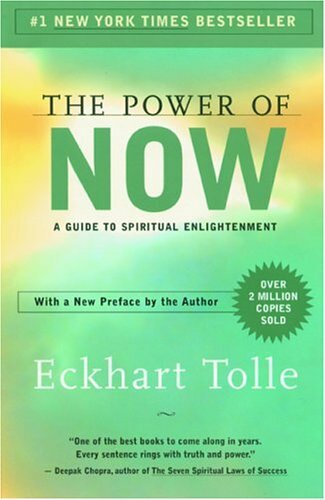 Before I get back to more work and then to PMBOK here’s something wonderful I learnt last night while reading Eckhart Tolle. I set goals and deadlines, sometimes panic and take on more than I can chew. 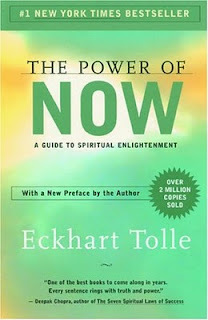 The book – The Power Of Now talks about simple stuff of looking towards the Now than the tomorrow. Why run behind something and not enjoy the running? Makes sense. So, even though I had nightmares about getting the car towed and the problems of getting to work- I gave it a try. I didn't panic. I just took one step at a time. It sure felt nice and better to be in control and not panic. The problem as he says- is a frame of mind that we force us to think of. There are no problems in life, only situations that need to be taken care of. If we focus on the NOW, it is all fun. So, when I ordered my red ipod I engraved -Happiness- is the essence of waking up everyday. What’s the point of toiling if I am not happy- is it not why I go to work? Or get up every morning? So, no matter what goals you have for life, it will all work out but the time is now. It will never come back. So, enjoy it, take deep breaths and live today, so you don’t have regrets tomorrow. Next week, spending time in New York with my parents who are visiting. Expect more tweets than blog post! This weekend was special, while I roamed the downtown in Chicago looking at museums (Chicago Art Museum and Science and Industry Museum), I figured that sometimes it’s important to take the initiative to do something that you have wanted to do forever. So, I ate some ice cream and read up some pending print outs stacked on my coffee table finally. 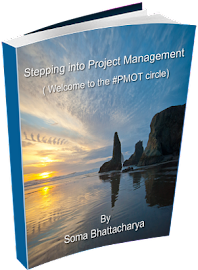 •If you have been planning to buy a project management book, keep your eyes open and follow some blogs. Most blogs have giveaways these days and you have the chance to get the book at no expense of yours. Try this one here. •Don’t have the time to upgrade or network, too busy with family and friends- get a phone that allows you to download these applications like linkedin, twitter etc. You can stay in touch while in the move and chances of getting your ROI are very likely. •Sick of hearing everyone telling you to get a mentor, it really helps. I have one, so get yours as well. 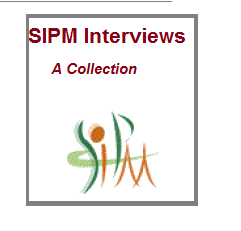 Try SIPM and get your mentor in your domain. •Need PDU’s and looking for more options; here’s one. PM- Podcast is giving away 20.5 PDU’s by simply listening to it. More information available here . 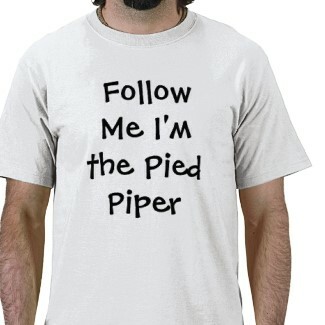 Email me (steppingintopm at gmail.com) with subject saying- I want the podcast. I will announce the winner on the 10 of next month. Leadership- why should you be listened to? If you were looking for random facts about me Pt1, here it is. Leadership is essential in projects and life; why others should accept your point of view is another.Know what you are doing, do your homework before you speak, use data if possible from your projects, reference's etc, build trust and respect your team. There’s another giveaway coming up this Friday, so gear up everybody! 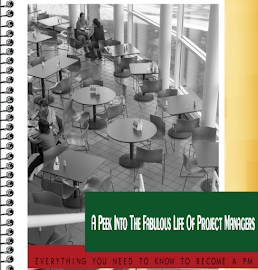 Want to have fun and learn more from real life Project Managers, check out here. This is personal, so if you are looking for reviews, PM updates or anything else, you might skip this post. I always talk/interact through my blog and yet there are times when I read my post and think how much of it am I really doing? •I am shy most of the time- I wish I could call up people and say- care to meet me for a blog interview and sushi/coffee/pasta? •I have analyzed my behaviors- not sure if it’s a culmination of not liking to driving long miles or fear of getting judged. •I dream big, have done it all my life- but I fall short when it comes to implementing it. •Sometimes I am not as consistent as I want to be (read trips to gym). It’s a joke now that if I am half as consistent as I am in blogging here, I will achieve any goal. •Sometimes I know what I have to do but I won’t do it. I procrastinate (in personal goals). •I don’t envy people usually, however sometimes I feel I had those qualities as they do. •By next year (Dec 31, 2011) I will double my annual income (honestly, I love the idea more than thinking and hard work involved in actually implementing it). •I changed the name of this blog, it still is called Stepping into Project Management, I removed the “newbies diary” from it and replaced with “the journey continues”. One of the reasons is doing that is I am not a newbie any more but I started out as one and I understand how it is. So, this blog is more about continuing my journey in the world of project management now and sharing it with you. •If you haven’t noticed the SIPM has updates too, there’s a new forum to talk, share and brainstorm ideas with the SIPM community. 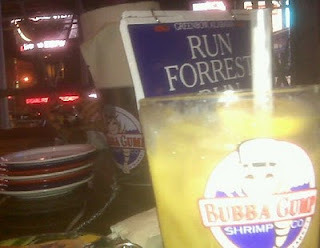 Anyone can read, to comment you have to be registered and you can do it here for free http://beta.steppingintopm.com/. Which translates: you are not defined and limited by your job responsibilities. You are more than what you are chained to do with your job. You or your personal brand is not a myth any more, your worth is all about what you have to offer. The elevator speech rules have changed, you don’t say anymore what your job position is with a xyz company- you say what you are and who you are (that is not your job description anymore). Most people while working decide to start on their own business, some like Steve Pavlina talks about how one should never get a job because it limits you. It’s very true, because jobs allow us to become complacent and not push ourselves anymore. By the time, we have been in jobs more than 5 years, we have changed, don’t have the fire in us what we had when we started and have come to an agreement with ourselves that we will let others (boss, organizations, future job titles, corner office) run us; than us running our own lives. While job has its benefits, don’t let the job title be your only motivation factor, because there is more to you than you know. A job is the stability we have asked for perhaps, but its not the end all. Don’t let your dream die just because your job says so. Infact having multiple skills might come in handy someday, so if you like to dance take classes and keep on doing it. Don’t give up because it doesn’t help your career in project management or you can’t do it professionally any more. Happiness and inner peace is always an integral factor in life and in finding meaning to life and vocation. 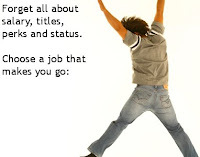 Choose to be happy, choose to do what you like to do along with your job description. Look out for more, listen more, interact with interesting people, see how people are changing their lives everyday. Don’t be complacent, just because you are a newbie (or whatever your role is) today, doesn’t mean you will be one for the rest of your life. Start getting ready now for the next position you are aiming at. So, when you are ready, you will be more prepared to look around and get that position and tell people that it’s time. The highest reward for a man’s toil is not what he gets from it but what he becomes by it- Ruskin. Unlike the picture here, I would think get the salary, job title and whatever comes with it but at the same time make sure you are still walking the path of your dream! If you are not, find a way to do it- be creative! Contact great minds or people whom you like to follow through twitter, see what they have to say, find similar groups or go to meet ups. The winner of PM-Prepcast is Jeremiah Jessel (will contact you with details). For the rest of you thank you for participating and better luck next time!